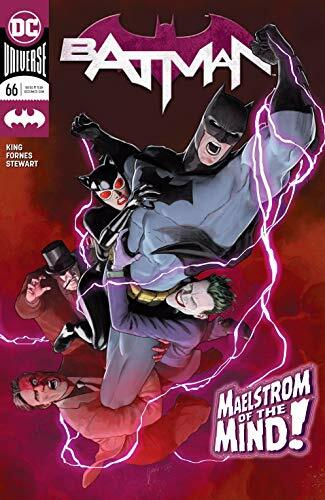 Tom King returns to the DC Comics series Batman. After a bizarre interlude with “The Price” the story-arc known as “Knightmares” kicks back into gear with issue 66. Batman is still experiencing nightmares. He’s seeing enemies and allies, this time the Question questions Catwoman on why she left the Batman. It interspersed with images of Batman and Catwoman, including recalls to an encounter with Two-Face. “Knightmares” was already a weak story, but this is the worst. Batman is the subject, but he is just talked about by the Question and Catwoman. I do enjoy these characters, but in this context, it was all just talking… and boring. Virtually nothing happens to move the story forward. It is just another dream, but not even an interesting one like Batman’s encounter with Professor Pyg. The artwork is excellent, but other than that, it was a disappointing entry in this series. What do you think? Let me know in the comments below. Tell me if there is a comic book, movie, or novel you would like me to review. While you are at it, check out my thoughts on the New ‘Avengers Endgame’ Trailer and the Batman VS TMNT trailer. Don’t forget to like, share, and subscribe for more posts like this one.